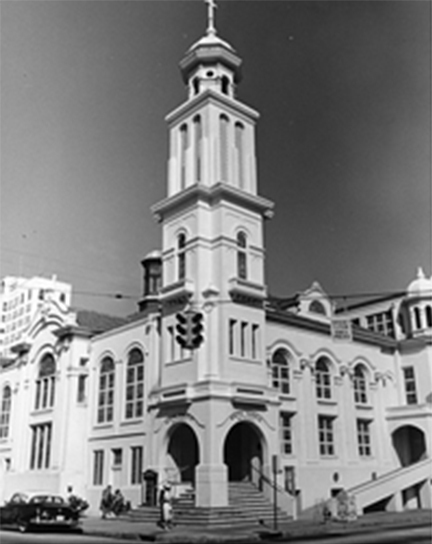 In 1966, two downtown congregations, Trinity Methodist Episcopal Church and White Temple Methodist Episcopal Church, merged to form our current congregation. Their combined history dates back since 1896. The diversity of our members reflects that of our multicultural city: each ethnicity, race, age and economic background. Torn apart by the tragedy of the War between the States, the Methodist Episcopal Church and the Methodist Episcopal Church, South, began their separate ministries to this community in the late 1890’s each on property given by Henry M. Flagler, a dedicated Presbyterian. 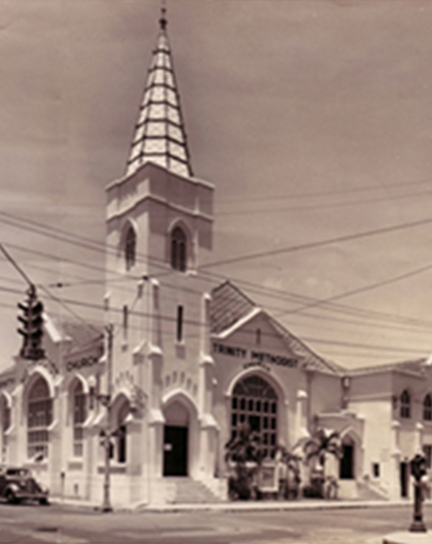 Worshiping in small white frame buildings of traditional architecture of the day, these congregations grew with the magic city of Miami and in 1913, the Northern congregation moved into its new building and became known as White Temple Methodist Episcopal Church. In 1915, the Southern congregation moved into its new structure and became Trinity Methodist Episcopal Church, South. In 1966, these churches agreed to merge and selected the name First United Methodist Church of Miami. Places of civic responsibility have been occupied by many of its members over the years. Some of the social agencies and organization of the city were founded by its members. Over 85 ministers and associates have served this congregation. Several new churches were started in the Miami area and other places-even one in China, by the congregation. Mission work around the world has been helped because of the influence and gifts of its people. The first Protestant congregation for Hispanics as well as Biscayne Manor Retirement Home were given birth through this congregation. The first Hot Meals program held outside a Federal Project was begun here. The many organizations within the church have been a strong influence in the community and in the world; the Church School; the Women’s groups, Men’s groups, Youth groups and the fine Music organizations, to name a few.